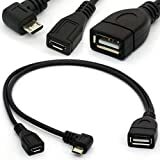 Connector 2: Micro USB female , micro-B plug to charge the extra USB device with a micro USB cable, such as usb flash disk, usb disk, usb hard disk that has micro USB Port. USB OTG cable for connecting USB devices such as usb keyboard, usb disk, GPS, USB DISK. external mass storage devices etc USB port to android smartphones and tablets with micro USB Port. Connector 3: One Straight Micro USB 5 Pin Female, the micro-B plug is for OTG device and also for Power charge. Micro USB Host OTG Cable with Micro USB Power for Amazon Fire TV, Fire TV Stick, Samsung i9100 i9300 i9220 i9250, Samsung Galaxy S7 S7 Edge, S6 S6+ S6 Edge, S5, S4 & Nexus 10 9 7 4 Player LG HTC Phones Tablets. It's a standard USB Micro-B HOST Cable , need your machine support usb host OTG function, so please confirm your device can support usb host OTG function before bidding. The disk format must be FAT32 if you connect the storage.